If no one will do anything, she’ll have to do it herself. 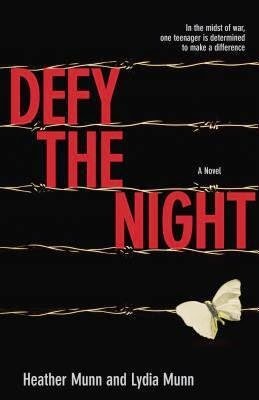 In 1941 France is still “free.” But fifteen-year-old Magali is frustrated by the cruel irony of pretending life is normal when food is rationed, new clothes are a rarity, and most of her friends are refugees. And now the government is actually helping the Nazis. Someone has got to do something, but it seems like no one has the guts—until Paquerette arrives. Smuggling refugee children is Paquerette’s job. And she asks Magali to help. When I first received this book I saw the title and assumed it was about vampires or something similar to that. As I started the first chapter I soon discovered that I was wrong in my assumption of whom or what the characters would be. I was immediately drawn into the story from the first page. When I read about the 2 children standing in line waiting for their “rationing tickets” I was hooked; I couldn’t wait to find out more about these characters and what their “story” was. As I got further into the book my stomach started getting nauseas and in knots because of the chances “Magali” kept taking to help rescue refugee children and get them to Paquerette. By the end of the book I found I was starting to hold my breath a little bit during certain parts of the story because I found it so nerve-racking and scary. I felt like I was in the story and helping “Magali” smuggle the children. I was thankful when the story ended; I don’t think I could have handled much more of such an intense and descriptive story. I love how this book was written; I like how each chapter has a “subtitle” with it. I found it was easy to know what to expect from that chapter and to figure out what the characters were going to experience. I love how the authors wrote the story; they wrote it as if the reader was the main character and he/she was experiencing everything that was going on and not just reading about it. I really like all of the details that Heather & Lydia Munn put into the story, I love how they described not only what “Magali” and the others characters saw, but also the details in the weather and the living situations, etc. Although I was happy to have the story end because of how jumpy I had become; I was also really sad to see this story end, I would love to see one or two more books be written about “Magali” and see how her life turned out and what she did and became in her adult life and such things.